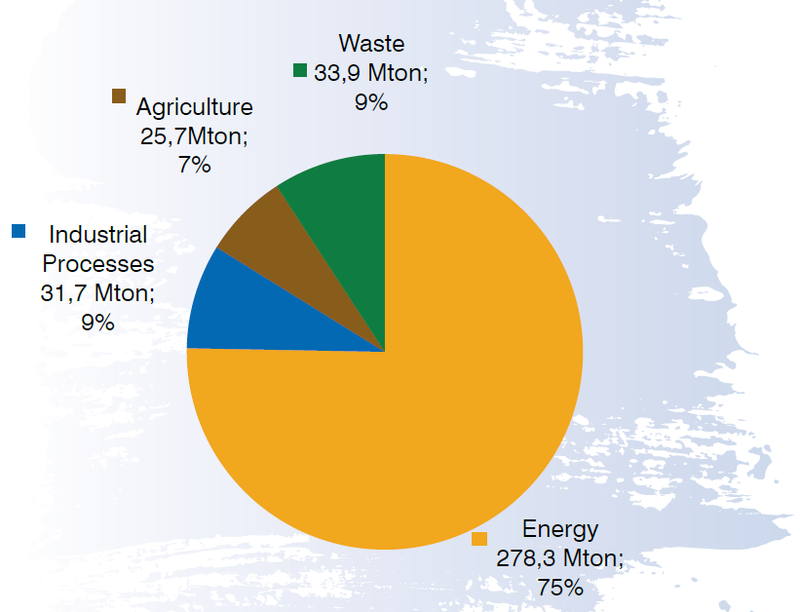 Three-quarters of Turkey’s emissions come from the energy sector. Not only is energy already the greatest source of emissions, the demand is also growing steadily. In 2010 the demand rose by 9.4%, almost double the world average of 5.6% and triple the 3.5% increase of the other OECD countries. (This disproportionate rate of increase should not be confused with high energy use per capita. On the contrary, Turkey’s per capita energy consumption is half that of the European Union and just below the global average. It is this disparity that awards Turkey an exemption from quantitative pledges, despite its Annex-1 status.) Such increases in demand have caused Turkey concern over the ability to meet the growing need. 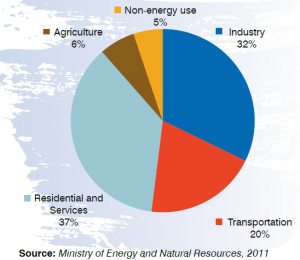 In recognition of this trend towards increasing energy demands, Turkey instituted an Energy Efficiency Law in 2007. This law created an Energy Efficiency Coordination Board and set the stage for implementing efficiency by requiring industries and business to appoint an “energy manager” and initiating tools for public awareness and training. Since then, regulations have been set regarding lighting, appliances, heating and cooling, building performance, and transportation. In 2012, the Ministry of Environment and Urbanism issued a Regulation on Monitoring of Greenhouse Gas Emissions. This regulation established procedures for mandatory monitoring and reporting by facilities that were characterized by certain activities. Such facilities include oil refineries, certain steel and iron production plants, clinker facilities above certain capacities, and large paper product factories. Turkey’s sectoral breakdown of energy consumption is shown in Figure 2. The main energy loss in buildings is based on lack of insulation. A telling statistic for this omission is that Turkey consumes ten times less insulation material per capita than Europe. The industry sector is being addressed through the aforementioned regulatory requirements. The potential for industry efficiency savings is 20%. Though the percentage of transport emissions are low compared other countries, this is due in part to poor efficiency in the other sectors and a lack of mobility. As Turkey’s economy increases, so does the use of transportation. Between 1990 and 2009, global transportation emissions increased by 44%, while Turkey’s increase was 78%. Therefore strategies are in place to increase railroad freight and develop an extensive, sustainable intercity system. We have the potential to save energy at least 15% in our industry, 35% in our buildings and 15% in our transport. The amount of energy saved will be higher than the energy we can generate using renewable energy resources. If we succeed in taking decisive and successful steps in energy efficiency, we can reduce our supply estimates for the year 2020 by at least 20% (i.e. 45 MTOE). This amount is 2.5 times larger than the amount of electricity we can generate from domestic and clean resources and can meet the energy requirement of 30 million households on the average. 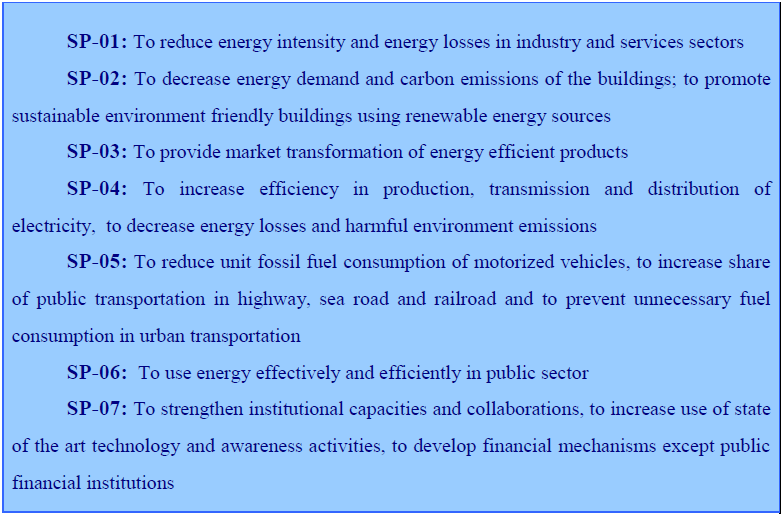 Looking forward, a ten year “Energy Efficiency Strategy Paper” was published in 2013. The strategy set a target of a 20% decrease in energy intensity by 2023. In pursuit of this target, the paper identified seven initiatives.